For the fourth installment of the Blue Label Series, Eighth Dimension sets its sights on the burgeoning house music scene of South Africa and an accomplished Cape Town-based DJ/producer by the name of Ryan Sullivan. With singles on various labels (including his own Gut Feel imprint) dating back to 2005, and the recent release of his debut artist album No One Will Ever Know (on Triplefire Music), Ryan Sullivan is certainly no stranger to the recording studio or DJ's playlists. He approached Eighth Dimension with a pair of tough, polished house music tracks that exhibited a unique mix of rhythmic ingenuity and melodic know-how, immediately grabbing the label's interest. 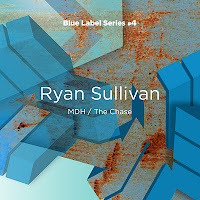 The two tracks, leading off this latest Blue Label Series release, are "MDH" and "The Chase." We say: Fantastic, atmospheric, moody originals, showing some proper production chops. Remixes are all great, too- highly recommended!